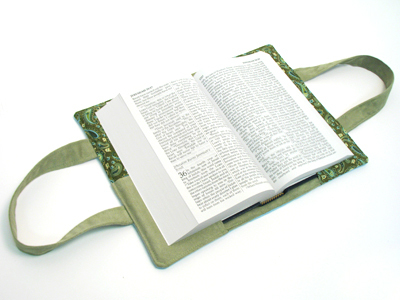 Give the book you turn to every day a beautiful and protective cover! 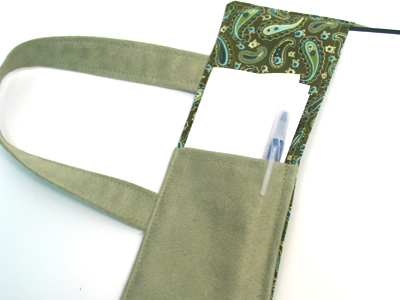 Inside pockets and sturdy handles make this a practical project that's a great gift for friends and family. Read below for these free project instructions. First we will prepare the fabric for the outer shell. 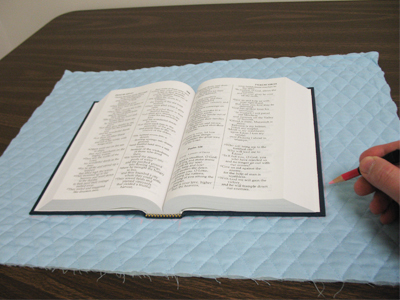 Lay the book open onto the quilted fabric and trace the shape. Be sure to also mark the spine at the top and bottom of the book. 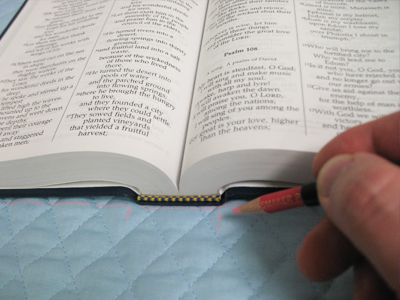 Using an air-erase pen or other marking tool, draw vertical lines connecting the marks of the spine. 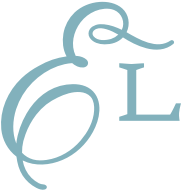 Then, on the right side of the shape (this will be the front cover), measure and mark the center of each side by measuring and dividing by two. Then, draw lines connecting the marks. Where the lines meet is the exact center of the right side of the shape. Spray a piece of medium weight cutaway stabilizer with temporary spray adhesive and smooth the fabric on top. 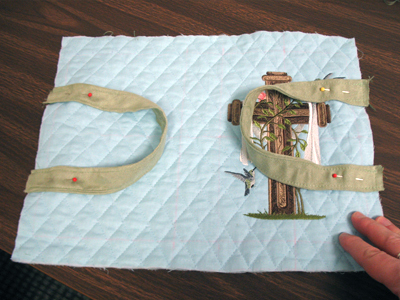 Then, hoop the fabric and stabilizer together by aligning the marks on the hoop with the lines on the fabric. Attach the hoop to the machine and load the design. Move the hoop so that the needle is directly over the center point on the fabric. Embroider the design. 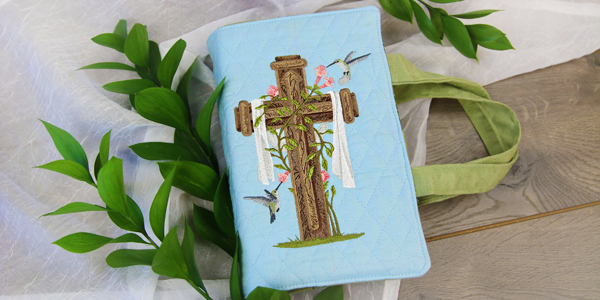 When the design has finished, trim away the excess stabilizer on the back side of the embroidery. 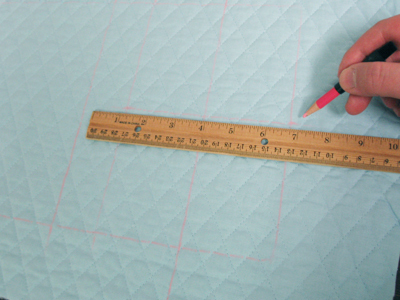 Measure and mark one inch out along the top and bottom edges of the shape. Also, measure and mark 1/2 inch out along the sides. Draw lines connecting the marks and then cut out the shape along these outer lines. Now we will prepare the fabric for the handles. 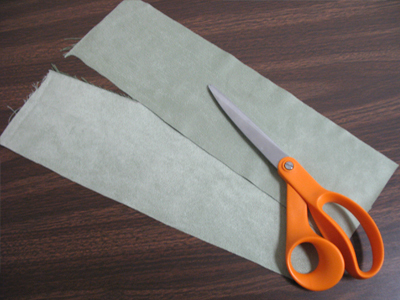 Cut two strips of fabric (we used faux suede) 4 inches wide by 14 inches long. 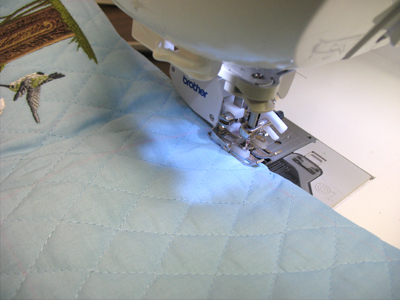 Fold the fabric lengthwise by bringing the long edges in to meet in the center of the fabric, with right side out. Press in place with an iron. Fold the fabric again with the long folded edges together, and press. Sew a 1/8 inch seam along both of the long edges. Now we will prepare the fabric for the inner flaps. 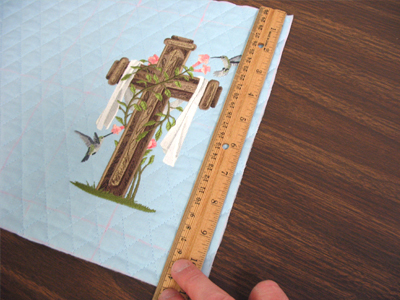 Measure the height of the embroidered outer shell piece. Cut two pieces of the cotton fabric to 8 inches wide by the height of the embroidered outer shell piece (ours is 11 inches high). Fold each piece lengthwise and press. 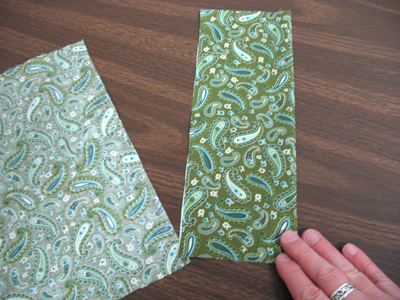 Then, sew a 1/4 inch seam along the folded edges only. Now we will prepare the inner pocket. Take the height measurement from the embroidered outer shell piece and divide it by two. Then, add 1/2 inch for seam allowance. 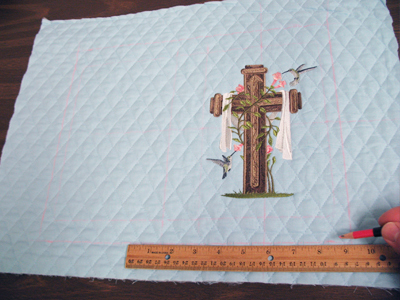 Cut a piece of fabric to 4 1/2 inches wide by the height dimension you just calculated. 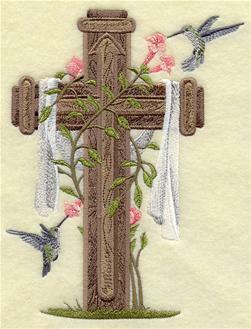 The height of our embroidered piece is 11 inches. So, we divided 11 by 2, which equals 5 1/2. Then, we added 1/2 inch - so, our final height dimension for the pocket is 6 inches. 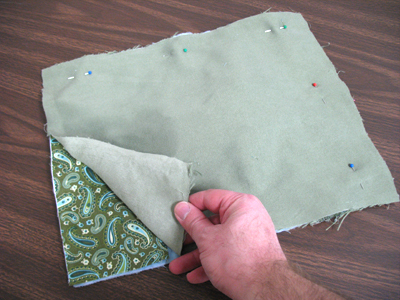 Fold the top edge of the pocket fabric over to the wrong side 1/2 inch, press, and sew a 1/4 inch seam along the top edge only. 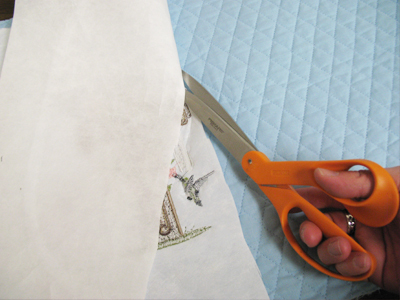 Then, fold the right side of the pocket fabric in 1/2 inch to the wrong side and press. 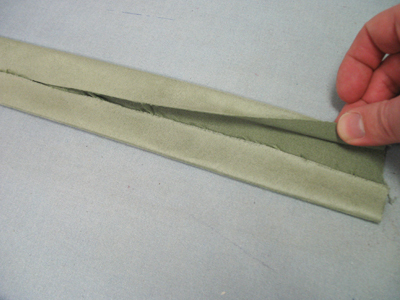 Lay one of the inner flaps with the seamed edge on the right. 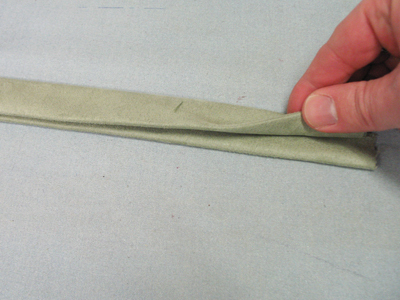 Then, align the folded edge of the pocket with the seamed edge of the inner flap, on the bottom of the flap. Pin in place and sew a 1/4 inch seam along the right folded edge only. It's time to assemble the cover! Lay the embroidered outer shell piece right side up. Next, pin the ends of the handles about 1 1/2 inches from the center of the each side of the outer shell with the handles lying to the inside. 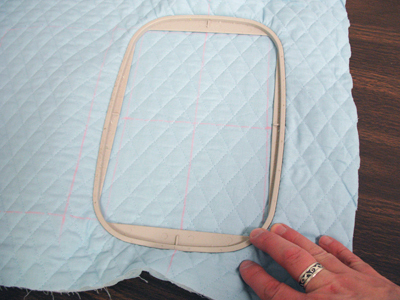 Align the inner flaps with the seamed edges facing in and the pocket side facing down. We placed the flap with the pocket on the right side so that when the cover is turned right side out, the pocket will be inside the front cover. To prepare the fabric for the inner lining, measure the outer shell and cut a piece to the same dimensions. Align the inner lining piece over the previous layers with the right side facing down. Pin all the layers in place and sew a 1/2 inch seam along the top and bottom edges and a 1/4 inch seam along the sides - leave a 4 inch to 5 inch gap along the bottom between the inner flaps for turning. Turn the cover right side out and flip the flaps over to the inside of the cover. 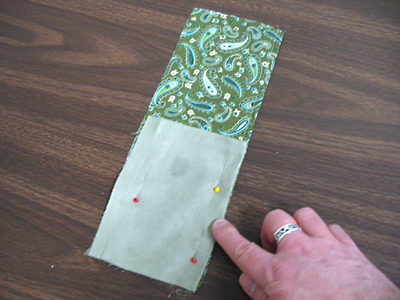 Press the outer seams and then fold the fabric of the opening in 1/2 inch, press, and pin in place. 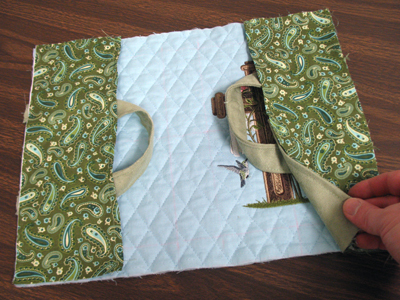 Topstitch a 1/8 inch seam along the entire outer edge of the cover - this finishes the edges and closes the opening. 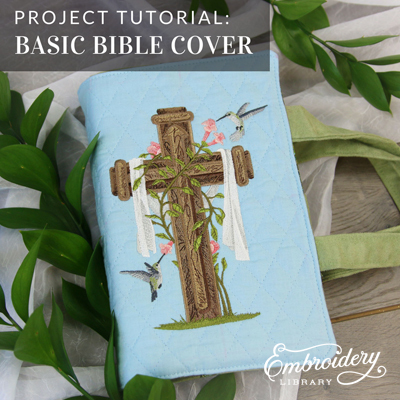 Your Bible cover is complete! An inner pocket holds pens and paper to ensure you're always ready to note inspirational passages. 5.86" x 7.73" | 4.85" x 6.38"